Krista joined Aldegrove in September 2013. Krista graduated tech school in the spring. She took a year off to work and learn more about animals and their care. She has always been fond of animals and enjoys spending time with them. Krista has a Chihuahua named Chiko a rabbit named Spud a few rescued birds and an albino corn snake named Pyro and two cats Striker and Benji a kitten from Aldergrove. 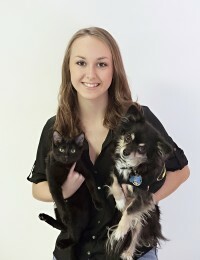 Krista loves working here and being able to help animals everyday.